While this gastritis home remedy is very capable of relieving the symptoms of annoying health problem, you shouldn’t forget to follow a healthy diet and your doctor’s recommendations. Your stomach is lined with a layer of cells known as the gastric mucosa. Its function is to protect against damage from the gastric juices. This protecting agent gets in the way of the formation of ulcers. At the same time, it has a very important role in balancing your digestive pH levels. However, after being exposed to certain factors, it can get irritated. It can also get weakened. If this isn’t controlled it can turn into something known as gastritis. This digestive disease is one of the most common in the world. It’s characterized by a bothering burning sensation at the top of your stomach. It also involves inflammation and pain. It develops in different ways for each case. But, most people also have nausea, gas, and general discomfort. Gastritis can be caused by using too many medications, a bad diet, using tobacco, or a Helicobacter pylori bacterial infection. Its treatment requires drastic changes in your diet. Sometimes, it requires the regular use of medications. Fortunately, there are some natural remedies. Their properties speed up healing while increasing your digestive functions. Among these options, we find an easy treatment. This gastritis home remedy only uses two ingredients. It both calms pain and reduces the symptoms. What’s in this gastritis home remedy? 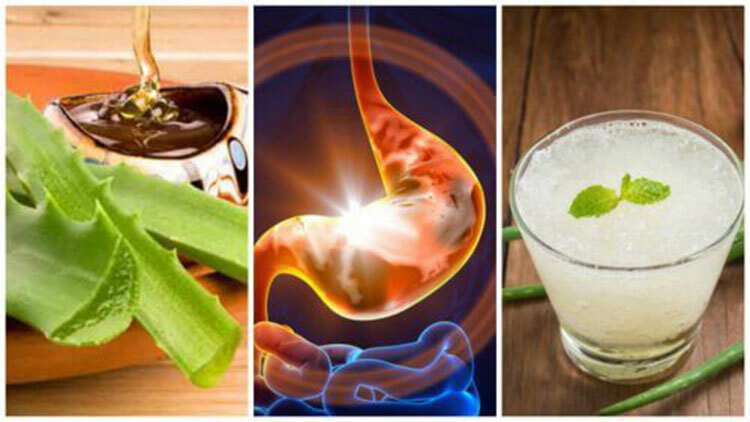 The gastritis home remedy that we want to share in this article is an easy aloe vera and honey syrup. Their properties make the perfect combination for quickly reducing this disease’s symptoms. Aloe vera gel is easily mixed with honey. The resulting product is easy for both children and adults to take. Today, we’re going to share some of the main properties these ingredients have that help this problem. Aloe vera gel is a very popular ingredient. It has been highly valued across history because of its high nutritional content. It has a large number of antioxidants, vitamins, and minerals. These give it anti-inflammatory, detoxifying, and antimicrobial properties. Eating it improves your digestive processes, reduces inflammation, and has a light laxative effect. This helps ease the removal of waste. Aloe vera has a substance known as aloin. Its effects increase intestinal movement and help microbial flora. It also gives mucilage. This is one of the active ingredients that recovers and protects the gastric mucosa. As a result, it reduces ulcers and excessive acid. Its healing effect increases the healing of the tissues affected by gastritis. Plus, it protects against future attacks. This is thought of as an alkaline ingredient. It’s great for balancing your body’s pH levels. Anytime it’s organic, honey is a complete food. It’s loaded with tons of essential nutrients. Honey stands out because of its energetic power and its many uses. Some of these uses have to do with health and beauty. It has large amounts of glucose and fructose. These are two kinds of natural sugars that are easily absorbed in your intestine. It has fiber and natural enzymes. These help your digestion and control inflammation. It isn’t known scientifically what the active ingredients are that control the symptoms of gastritis. However, some think that it’s due to its ability to slow bacterial growth. The treatment with aloe vera and honey is a very good complement to other gastritis treatments. It especially helps those who have to constantly fight the problems that cause gastritis. This is very easy to prepare. Plus, its ingredients are very easy to get in the store. Take out the gel from an entire aloe vera leaf. Put it in the blender with the honey and water. Blend everything for a few seconds until smooth. After feeling the first signs of gastritis, pour this drink in a glass and sip it. Drink it as you need it, up to two times per day. Avoid taking more than recommended. This is because its laxative effect can cause unwanted side effects. Keep in mind that, while it’s effective, this drink doesn’t replace medications or your doctor’s recommendations. Also, it’s vital to have a healthy and balanced diet to get all of its benefits.